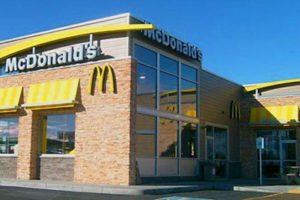 This international franchise approached us with a specific task in mind. They had a series of canopies and arches used on the façade of their restaurant that needed painting. We mixed and catalysed the paint using Graco ProMix 2KE paint mixer in our specially designed paint mixing room and prepared the cross draft spray booths. The panels were then primed to customer specs and painted to spec and mil thicknesses. The arches were then dried in our temperature controlled facilities. Serial stickers were applied and lighting covers were assembled. After inspection of paint application, adhesion and gloss finish, any necessary touch-ups were applied. The products were loaded onto pallets and custom designed racking systems, and packed with foam to prevent any transport related damage.